Harriet Beecher Stowe's short story, Christmas in Poganuc was published in the collection, A Budget of Christmas Tales by Charles Dickens and Others (1895). 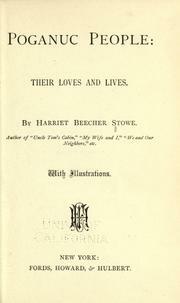 Mrs. Stowe also wrote Poganuc People: Their Loves and Lives . The story is set in early New England colonial times, featuring Dolly, who was left alone while the village gathers at the church's Christmas greens to celebrate. Can any of us look back to the earlier days of our mortal pilgrimage and remember the helpless sense of desolation and loneliness caused by being forced to go off to the stillness and darkness of a solitary bed far from all the beloved voices and employments and sights of life? Can we remember lying, hearing distant voices, and laughs of more fortunate, older people and the opening and shutting of distant doors, that told of scenes of animation and interest from which we were excluded? How doleful sounded the tick of the clock, and how dismal was the darkness as sunshine faded from the window, leaving only a square of dusky dimness in place of daylight! All who remember these will sympathize with Dolly, who was hustled off to bed by Nabby the minute supper was over, that she might have the decks clear for action. "Now be a good girl; shut your eyes, and say your prayers, and go right to sleep," had been Nabby's parting injunction as she went out, closing the door after her. "'Now I lay me down to sleep.'" But sleep she could not. The wide, bright, wistful blue eyes lay shining like two stars toward the fading light in the window, and the little ears were strained to catch every sound. She heard the shouts of Tom and Bill and the loud barking of Spring as they swept out of the door; and the sound went to her heart. Spring--her faithful attendant, the most loving and sympathetic of dogs, her friend and confidential counselor in many a solitary ramble--Spring had gone with the boys to see the sight, and left her alone. She began to pity herself and cry softly on her pillow. For a while she could hear Nabby's energetic movements below, washing up dishes, putting back chairs, and giving energetic thumps and bangs here and there, as her way was of producing order. But by and by that was all over, and she heard the loud shutting of the kitchen door and Nabby's voice chatting with her attendant as she went off to the scene of gaiety. In those simple, innocent days in New England villages nobody thought of locking house doors at night. There was in those times no idea either of tramps or burglars, and many a night in summer had Dolly lain awake and heard the voices of tree-toads and whip-poor-wills mingling with the whisper of leaves and the swaying of elm boughs, while the great outside door of the house lay broad open in the moonlight. But then this was when everybody was in the house and asleep, when the door of her parents' room stood open on the front hall, and she knew she could run to the paternal bed in a minute for protection. Now, however, she knew the house was empty. Everybody had gone out of it; and there is something fearful to a little lonely body in the possibilities of a great, empty house. She got up and opened her door, and the "tick-tock" of the old kitchen clock for a moment seemed like company; but pretty soon its ticking began to strike louder and louder with a nervous insistency on her ear, till the nerves quivered and vibrated, and she couldn't go to sleep. She lay and listened to all the noises outside. It was a still, clear, freezing night, when the least sound clinked with a metallic resonance. She heard the runners of sleighs squeaking and crunching over the frozen road, and the lively jingle of bells. They would come nearer, nearer, pass by the house, and go off in the distance. Those were the happy folks going to see the gold star and the Christmas greens in the church. The gold star, the Christmas greens, had all the more attraction from their vagueness. Dolly was a fanciful little creature, and the clear air and romantic scenery of a mountain town had fed her imagination. Stories she had never read, except in the Bible and the Pilgrim's Progress, but her very soul had vibrated with the descriptions of the celestial city--something vague, bright, glorious, lying beyond some dark river; and Nabby's rude account of what was going on in the church suggested those images. "_Glory be to God on high; and on earth peace, good will toward men._"
"_We praise Thee, we bless Thee, we worship Thee, we glorify Thee, we give thanks to Thee for Thy great glory, O Lord God, Heavenly King, God, the Father Almighty._"
Her heart throbbed and beat; she trembled with a strange happiness and sat as one entranced till the music was over. Then came reading, the rustle and murmur of people kneeling, and then they all rose and there was the solemn buzz of voices repeating the Creed with a curious lulling sound to her ear. There was old Mr. Danforth with his spectacles on, reading with a pompous tone, as if to witness a good confession for the church; and there were Squire Lewis and old Ma'am Lewis; and there was one place where they all bowed their heads and all the ladies made courtesies--all of which entertained her mightily. When the sermon began Dolly got fast asleep, and slept as quietly as a pet lamb in a meadow, lying in a little warm roll back under the shadows of the spruces. She was so tired and so sound asleep that she did not wake when the service ended, lying serenely curled up, and having perhaps pleasant dreams. She might have had the fortunes of little Goody Two-Shoes, whose history was detailed in one of the few children's books then printed, had not two friends united to find her out. Spring, who had got into the slip with the boys, and been an equally attentive and edified listener, after service began a tour of investigation, dog-fashion, with his nose; for how could a minister's dog form a suitable judgment of any new procedure if he was repressed from the use of his own leading faculty? So, Spring went round the church conscientiously, smelling at pew doors, smelling of the greens, smelling at the heels of gentlemen and ladies, till he came near the door of the church, when he suddenly smelt something which called for immediate attention, and he made a side dart into the thicket where Dolly was sleeping, and began licking her face and hands and pulling her dress, giving short barks occasionally, as if to say, "Come, Dolly, wake up!" At the same instant Hiel, who had seen her from the gallery, came down just as the little one was sitting up with a dazed, bewildered air. "Why, Dolly, how came you out o' bed this time o' night? Don't ye know the nine o'clock bell's jest rung?" "They were all gone away, and I was so lonesome!" Hiel took her up in his long arms and carried her home, and was just entering the house door with her as the sleigh drove up with Parson Cushing and his wife. "Wal, Parson, your folks has all ben to the 'lumination--Nabby and Bill and Tom and Dolly here; found her all rolled up in a heap like a rabbit under the cedars." "Why, Dolly Cushing!" exclaimed her mother. "What upon earth got you out of bed this time of night? You'll catch your death o' cold." "I was all alone," said Dolly, with a piteous bleat. "Oh, there, there, wife; don't say a word," put in the parson. "Get her off to bed. Never mind, Dolly, don't you cry;" for Parson Cushing was a soft-hearted gentleman and couldn't bear the sight of Dolly's quivering under lip. So Dolly told her little story, how she had been promised a sugar dog by Nabby if she'd be a good girl and go to sleep, and how she couldn't go to sleep, and how she just went down to look from the yard, and how the music drew her right over. "There, there," said Parson Cushing, "go to bed, Dolly; and if Nabby don't give you a sugar dog, I will. This Christmas dressing is all nonsense," he added, "but the child's not to blame--it was natural." "After all," he said to his wife the last thing after they were settled for the night, "our little Dolly is an unusual child. There were not many little girls that would have dared to do that. I shall preach a sermon right away that will set all this Christmas matter straight," said the Doctor. "There is not a shadow of evidence that the first Christians kept Christmas. It wasn't kept for the first three centuries, nor was Christ born anywhere near the 25th of December." The next morning found little Dolly's blue eyes wide open with all the wondering eagerness of a new idea. Dolly had her wise thoughts about Christmas. She had been terribly frightened at first, when she was brought home from the church; but when her papa kissed her and promised her a sugar dog she was quite sure that, whatever the unexplained mystery might be, he did not think the lovely scene of the night before a wicked one. And when Mrs. Cushing came and covered the little girl up warmly in bed, she only said to her, "Dolly, you must never get out of bed again at night after you are put there; you might have caught a dreadful cold and been sick and died, and then we should have lost our little Dolly." So Dolly promised quite readily to be good and lie still ever after, no matter what attractions might be on foot in the community. Much was gained, however, and it was all clear gain; and forthwith the little fanciful head proceeded to make the most of it, thinking over every feature of the wonder. The child had a vibrating, musical organization, and the sway and rush of the chanting still sounded in her ears and reminded her of that wonderful story in the "Pilgrim's Progress", where the gate of the celestial city swung open, and there were voices that sung, "Blessing and honor and glory and power be unto Him who sitteth on the throne." And then that wonderful star, that shone just as if it were a real star--how could it be! For Miss Ida Lewis, being a young lady of native artistic genius, had cut a little hole in the centre of her gilt paper star, behind which was placed a candle, so that it gave real light, in a way most astonishing to untaught eyes. In Dolly's simple view it verged on the supernatural--perhaps it was _the_ very real star read about in the Gospel story. Why not? Dolly was at the happy age when anything bright and heavenly seemed credible, and had the child-faith to which all things were possible. "I wish, my dear," said Mrs. Cushing, after they were retired to their room for the night, "that to-morrow morning you would read the account of the birth of Christ in St. Matthew, and give the children some advice upon the proper way of keeping Christmas." "Well, but you know we don't _keep_ Christmas; nobody knows anything about Christmas," said the Doctor. "You know what I mean, my dear," replied his wife. "You know that my mother and her family _do_ keep Christmas. I always heard of it when I was a child; and even now, though I have been out of the way of it so long, I cannot help a sort of kindly feeling toward these ways. I am not surprised at all that the children got drawn over last night to the service. I think it's the most natural thing in the world, and I know by experience just how attractive such things are. I shouldn't wonder if this other church should draw very seriously on your congregation; but I don't want it to begin by taking away our own children. Dolly is an inquisitive child; a child that thinks a good deal, and she'll be asking all sorts of questions about the why and wherefore of what she saw last night." "Oh, yes, Dolly is a bright one. Dolly's an uncommon child," said the Doctor, who had a pardonable pride in his children--they being, in fact, the only worldly treasure that he was at all rich in. "Papa gives you this, not because it is Christmas, but because he loves his little Dolly." "But _isn't_ it Christmas?" asked Dolly with a puzzled air. "No, child; nobody knows when Christ was born, and there is nothing in the Bible to tell us _when_ to keep Christmas." "While shepherds watched their flocks by night." "Now, children," he said when all was over, "you must be good children and go to school. If we are going to keep any day on account of the birth of Christ, the best way to keep it is by doing all our duties on that day better than any other. Your duty is to be good children, go to school and mind your lessons." Tom and Bill were quite ready to fall in with their father's view of the matter. As for Dolly, she put her little tongue advisedly to the back of her sugar dog and found that he was very sweet indeed--a most tempting little animal. She even went so far as to nibble off a bit of the green ground he stood on--yet resolved heroically not to eat him at once, but to make him last as long as possible. She wrapped him tenderly in cotton and took him to the school with her, and when her confidential friend, Bessie Lewis, displayed her Christmas gifts, Dolly had something on her side to show, though she shook her curly head and informed Bessie in strict confidence that there wasn't any such thing as Christmas, her papa had told her so--a heresy which Bessie forthwith reported when she went home at noon. "Poor little child--and did she say so?" asked gentle old Grandmamma Lewis. "Well, dear, you mustn't blame her--she don't know any better. You bring the little one in here to-night and I'll give her a Christmas cooky. I'm sorry for such children." And so, after school, Dolly went in to see dear old Madam Lewis, who sat in her rocking-chair in the front parlor, where the fire was snapping behind great tall brass andirons and all the pictures were overshadowed with boughs of spruce and pine. Dolly gazed about her with awe and wonder. Over one of the pictures was suspended a cross of green with flowers of white everlasting. "What is _that_ for?" asked Dolly, pointing solemnly with her little forefinger, and speaking under her breath. "Dear child, that is the picture of my poor boy who died--ever so many years ago. That is my cross--we have all one--to carry." Dolly did not half understand these words, but she saw tears in the gentle old lady's eyes and was afraid to ask more. She accepted thankfully and with her nicest and best executed courtesy a Christmas cooky representing a good-sized fish, with fins all spread and pink sugar-plums for eyes, and went home marveling yet more about this mystery of Christmas. As she was crossing the green to go home the Poganuc stage drove in, with Hiel seated on high, whipping up his horses to make them execute that grand _entree_ which was the glory of his daily existence. Now that the stage was on runners, and slipped noiselessly over the smooth frozen plain, Hiel cracked his whip more energetically and shouted louder, first to one horse then to another, to make up for the loss of the rattling wheels; and he generally had the satisfaction of seeing all the women rushing distractedly to doors and windows, and imagined them saying, "There's Hiel; the stage is in!" "Hulloa, Dolly!" he called out, drawing up with a suddenness which threw the fore-horses back upon their haunches. "I've got a bundle for your folks. Want to ride? You may jest jump up here by me and I'll take you 'round to your father's door;" and so Dolly reached up her little red-mittened hand, and Hiel drew her up beside him. "'Xpect ye want a bit of a ride, and I've got a bundle for Widder Badger, down on South Street, so I guess I'll go 'round that way to make it longer. I 'xpect this 'ere bundle is from some of your ma's folks in Boston--'Piscopals they be and keeps Christmas. Good-sized bundle 'tis; reckon it'll come handy in a good many ways." So, after finishing his detour, Hiel landed his little charge at the parsonage door. "Reckon I'll be over when I've put up my hosses," he said to Nabby when he handed down the bundle to her. "I hain't been to see you much lately, Nabby, and I know you've been a-pinin' after me, but fact is--"
"Well, now, Hiel Jones, you jest shet up with your imperence," said Nabby, with flashing eyes; "you jest look out or you'll get suthin." "I 'xpect to get a kiss when I come 'round to-night," said Hiel, composedly. "Take care o' that air bundle, now; mebbe there's glass or crockery in't." "Hiel Jones," said Nabby, "don't give me none o' your saace, for I won't take it. Jim Sawin said last night you was the brassiest man he ever see. He said there was brass enough in your face to make a kettle of." "Well, I hope he will come! I'd jest like a chance to show him how little I care for him." "Mother worries because she thinks you won't get any Christmas presents. However, this comes to give every one of you some of the crumbs which fall from the church's table, and Mother says she wishes you all a pious Christmas, which she thinks is better than a merry one. If I didn't lay violent hands on her she would use all our substance in riotous giving of Christmas presents to all the beggars and chimney sweeps in Boston. She is in good health and talks daily of wanting to see you and the children; and I hope before long you will bring some of them, and come and make us a visit. There was a scene of exultation and clamor in the parsonage as these presents were pulled out and discussed; and when all possible joy was procured from them in the sitting-room, the children rushed in a body into the kitchen and showed them to Nabby, calling on her to join their acclamations. On the whole, when Dolly had said her prayers that night and thought the matter over, she concluded that her Christmas Day had been quite a success. Once more had Christmas come round in Poganuc; once more the Episcopal church was being dressed with ground-pine and spruce; but this year economy had begun to make its claims felt. An illumination might do very well to open a church, but there were many who said "to what purpose is this waste?" when the proposition was made to renew it yearly. Consequently it was resolved to hold the Christmas Eve service with only that necessary amount of light which would enable the worshipers to read the prayers. On this Christmas Eve Dolly went to bed at her usual hour with a resigned and quiet spirit. She felt herself a year older, and more than a year wiser, than when Christmas had first dawned upon her consciousness. Mis' Persis appeared on the ground by day-dawn. A great kettle was slung over the kitchen fire, in which cakes of tallow were speedily liquefying; a frame was placed quite across the kitchen to sustain candle-rods, with a train of boards underneath to catch the drippings, and Mis' Persis, with a brow like one of the Fates, announced: "Now we can't hev any young 'uns in this kitchen to-day;" and Dolly saw that there was no getting any attention in that quarter. Mis' Persis, in a gracious Saturday afternoon mood, sitting in her own tent-door dispensing hospitalities and cookies, was one thing; but Mis' Persis in her armor, with her loins girded and a hard day's work to be conquered, was quite another: she was terrible as Minerva with her helmet on. Dinner-baskets for all the children were hastily packed, and they were sent off to school with the injunction on no account to show their faces about the premises till night. The Doctor, warned of what was going on, retreated to his study at the top of the house, where, serenely above the lower cares of earth, he sailed off into President Edwards' treatise on the nature of true virtue, concerning which he was preparing a paper to read at the next association meeting. That candles were a necessity of life he was well convinced, and by faith he dimly accepted the fact that one day in the year the whole house was to be devoted and given up to this manufacture; and his part of the business, as he understood it, was, clearly, to keep himself out of the way till it was over. "There won't be much of a dinner at home, anyway," said Nabby to Dolly, as she packed her basket with an extra doughnut or two. "I've got to go to church to-day, 'cause I'm one of the singers, and your ma'll be busy waitin' on _her_; so we shall just have a pick-up dinner, and you be sure not to come home till night; by that time it'll be all over." Dolly trotted off to school well content with the prospect before her: a nooning, with leave to play with the girls at school, was not an unpleasant idea. But the first thing that saluted her on her arrival was that Bessie Lewis--her own dear, particular Bessie--was going to have a Christmas party at her house that afternoon, and was around distributing invitations right and left among the scholars with a generous freedom. "We are going to have nuts, and raisins, and cakes, and mottoes," said Bessie, with artless triumph. The news of this bill of fare spread like wildfire through the school. Never had a party been heard of which contemplated such a liberal entertainment, for the rising generation of Poganuc were by no means wearied with indulgence, and raisins and almonds stood for grandeur with them. But these _mottoes_, which consisted of bits of confectionery wrapped up in printed couplets of sentimental poetry, were an unheard-of refinement. Bessie assured them that her papa had sent clear to Boston for them, and whoever got one would have his or her fortune told by it. The school was a small, select one, comprising the children of all ages from the best families of Poganuc. Both boys and girls, and all with great impartiality, had been invited. Miss Titcome, the teacher, quite readily promised to dismiss at three o'clock that afternoon any scholar who should bring a permission from parents, and the children nothing doubted that such a permission was obtainable. Dolly alone saw a cloud in the horizon. She had been sent away with strict injunctions not to return till evening, and children in those days never presumed to make any exceptions in obeying an absolute command of their parents. "But, of course, you will go home at noon and ask your mother, and of course she'll let you; won't she, girls?" said Bessie. "Oh, certainly; of course she will," said all the older girls, "because you know a party is a thing that don't happen every day, and your mother would think it strange if you _didn't_ come and ask her." So, too, thought Miss Titcome, a most exemplary, precise and proper young lady, who always moved and spoke and thought as became a schoolmistress, so that, although she was in reality only twenty years old, Dolly considered her as a very advanced and ancient person--if anything, a little older than her father and mother. Even she was of opinion that Dolly might properly go home to lay a case of such importance before her mother; and so Dolly rushed home after the morning school was over, running with all her might, and increasing in mental excitement as she ran. Her bonnet blew off upon her shoulders, her curls flew behind her in the wind, and she most inconsiderately used up the little stock of breath that she would want to set her cause in order before her mother. Just here we must beg any mother and housekeeper to imagine herself in the very midst of the most delicate, perplexing and laborious of household tasks, when interruption is most irksome and perilous, suddenly called to discuss with a child some new and startling proposition to which at the moment she cannot even give a thought. Mrs. Cushing was sitting in the kitchen with Mis' Persis, by the side of a caldron of melted tallow, kept in a fluid state by the heat of a portable furnace on which it stood. A long train of half-dipped candles hung like so many stalactites from the frames on which the rods rested, and the two were patiently dipping set after set and replacing them again on the frame. "As sure as I'm alive! if there isn't Dolly Cushing comin' back--runnin' and tearin' like a wild cretur'," said Mis' Persis. "She'll be in here in a minute and knock everything down!" Mrs. Cushing looked, and with a quick movement stepped to the door. "Dolly! what are you here for? Didn't I tell you not to come home this noon?" "Oh, mamma, there's going to be a party at General Lewis'--Bessie's party--and the girls are all going; mayn't I go?" "No, you can't; it's impossible," said her mother. "Your best dress isn't ready to wear, and there's nobody can spend time to get you ready. Go right back to school." "Go!" said her mother, in the decisive tone that mothers used in the old days, when arguing with children was not a possibility. "What's all this about?" asked the Doctor, looking out of the door. "Why," said Mrs. Cushing, "there's going to be a party at General Lewis', and Dolly is wild to go. It's just impossible for me to attend to her now." "Oh, I don't want her intimate at Lewis's," said the Doctor, and immediately he came out behind his wife. "There; run away to school, Dolly," he said. "Don't trouble your mother; you don't want to go to parties; why, it's foolish to think of it. Run away now, and don't think any more about it--there's a good girl!" Dolly turned and went back to school, the tears freezing on her cheek as she went. As for not thinking any more about it--that was impossible. When three o'clock came, scholar after scholar rose and departed, until at last Dolly was the only one remaining in the school-room. When Dolly came home that night the coast was clear, and the candles were finished and put away to harden in a freezing cold room; the kitchen was once more restored, and Nabby bustled about getting supper as if nothing had happened. "I really feel sorry about poor little Dolly," said Mrs. Cushing to her husband. "Do you think she cared much?" asked the Doctor, looking as if a new possibility had struck his mind. "Yes, indeed, poor child, she went away crying; but what could I do about it? I couldn't stop to dress her." "Wife, we must take her somewhere to make up for it," said the Doctor. Just then the stage stopped at the door and a bundle from Boston was handed in. Dolly's tears were soon wiped and dried, and her mourning was turned into joy when a large jointed London doll emerged from the bundle, the Christmas gift of her grandmother in Boston. Dolly's former darling was old and shabby, but this was of twice the size, and with cheeks exhibiting a state of the most florid health. Besides this there was, as usual in grandmamma's Christmas bundle, something for every member of the family; and so the evening went on festive wings. Poor little Dolly! only that afternoon she had watered with her tears, at school, the dismal long straight seam, which stretched on before her as life sometimes does to us, bare, disagreeable and cheerless. She had come home crying, little dreaming of the joy just approaching; but before bed-time no cricket in the hearth was cheerier or more noisy. She took the new dolly to bed with her, and could hardly sleep, for the excitement of her company. "I was drivin' by Tim Hawkins', and Mis' Hawkins she comes out and says they're goin' to hev an apple-cuttin' there to-morrow night, and she would like to hev you and Mis' Cushin' and all your folks come--Nabby and all." The Doctor and his lady of course assented. "Wal, then, Doctor--ef it's all one to you," continued Hiel, "I'd like to take ye over in my new double sleigh. I've jest got two new strings o' bells up from Boston, and I think we'll sort o' make the snow fly. S'pose there'd be no objections to takin' my mother 'long with ye?" "Oh, Hiel, we shall be delighted to go in company with your mother, and we're ever so much obliged to you," said Mrs. Cushing. "Wal, I'll be round by six o'clock," said Hiel. "Then, wife," said the Doctor, "we'll take Dolly, and make up for the loss of her party." Punctually at six, Hiel's two horses, with all their bells jingling, stood at the door of the parsonage, whence Tom and Bill, who had been waiting with caps and mittens on for the last half hour, burst forth with irrepressible shouts of welcome. "Take care now, boys; don't haul them buffalo skins out on t' the snow," said Hiel. "Don't get things in a muss gen'ally; wait for your ma and the Doctor. Got to stow the grown folks in fust; boys kin hang on anywhere." And so first came Mrs. Cushing and the Doctor, and were installed on the back seat, with Dolly in between. Then hot bricks were handed in to keep feet warm, and the buffalo robe was tucked down securely. Then Nabby took her seat by Hiel in front, and the sleigh drove round for old Mrs. Jones. The Doctor insisted on giving up his place to her and tucking her warmly under the buffalo robe, while he took the middle seat and acted as moderator between the boys, who were in a wild state of hilarity. Spring, with explosive barks, raced first on this and then on that side of the sleigh as it flew swiftly over the smooth frozen road. The stars blinked white and clear out of a deep blue sky, and the path wound up-hill among cedars and junipers and clumps of mountain laurel, on whose broad green leaves the tufts of snow lay like clusters of white roses. The keen clear air was full of stimulus and vigor; and so Hiel's proposition to take the longest way met with enthusiastic welcome from all the party. Next to being a bird, and having wings, is the sensation of being borne over the snow by a pair of spirited horses who enjoy the race, apparently, as much as those they draw. Though Hiel contrived to make the ride about eight miles, it yet seemed but a short time before the party drove up to the great red farmhouse, whose lighted windows sent streams of radiant welcome far out into the night. Our little Dolly had had an evening of unmixed bliss. Everybody had petted her, and talked to her, and been delighted with her sayings and doings, and she was carrying home a paper parcel of sweet things which good Mrs. Hawkins had forced into her hand at parting. She had spent a really happy Christmas! You might enjoy Stowe's The First Christmas of New England . We also recommend our selection of Christmas Stories. Add Christmas In Poganuc to your own personal library.